Beloved and respected brothers and sisters! It is tremendous privilege and an honor to be with you today for this special gathering of so many young Family Federation members and university students from all over the world. Your passion and enthusiasm, which I was able to witness on my way here after greeting True Mother, inspires me and deeply moves my heart. Thank you for your attendance to True Parents, and thank you for all your effort to make the ideal of Cheon Il Guk a living reality. Your dynamic energy and youthful vitality gives absolute hope for the future of our Unification community. Your motto “here we are!” and your presence here today is a source of boundless joy for our beloved True Parents. I thank you for your pledge of “devotion of hope” as true filial sons and daughters to Heavenly Parent and True Parents. Our True Parents have opened the way for each one of us to know the reality of our Heavenly Parent’s heart of restoration and unconditional love. True Parents deserve our eternal respect, true love, and gratitude. As we will pay tribute to our True Father, on the 3rd Anniversary of his Ascension, let us sincerely open our hearts, souls, and minds to inherit and leave a lasting legacy for future generations. Let us unite and synergize our talents and energy as one family. This is a time for deep reflection about who we are, why we are here, and what we can do as young people to create a world of lasting peace, love and prosperity. This is a treasured and prime time for each one of us to make a new determination. This is a time for a new beginning, a time to tap into the infinite potential and ability that resides in each of you gathered here today. The potential energy of fulfilling this dream of peace for our Unification community and the world is embodied within each one of you. It is my great pleasure to witness and share this moment with all of you, and I am deeply grateful to be here with all of you! But let us never forget that who we are as Blessed Central Families is only made possible by True Parents absolute and complete attendance to Heavenly Parent, and their absolute true love for all of humanity. 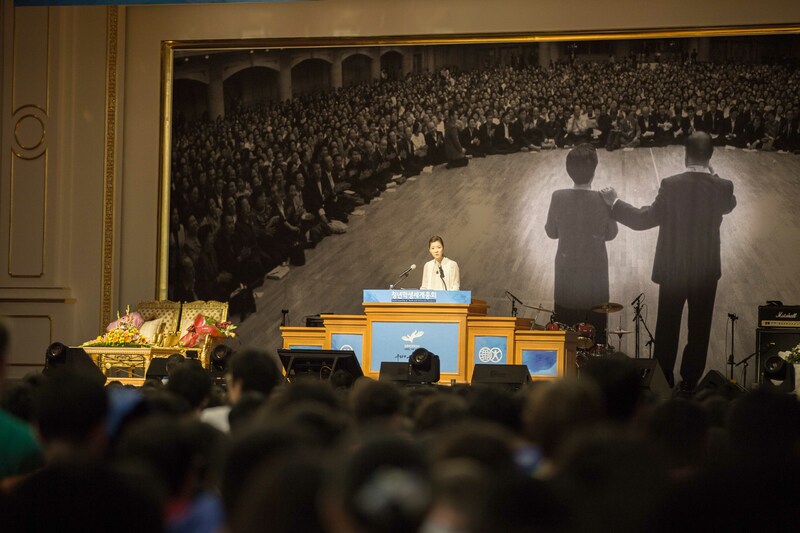 While attending True Mother over the past few years, I have learned so many important lessons and gained so many deep insights from True Mother and by reading True Father’s words through Hoon Dok Hae. True Mother absolutely mastered every level of true love, faith and obedience. I marvel at her character and her example. Time and again, I am profoundly moved by the depth of her heart and her amazing strength to love unconditionally. No matter what kind of situation or difficulty she faces, True Mother always places Heavenly Parent’s heart and Will as her first priority. Her entire life is dedicated to the providence, and she offers devotion day and night for this purpose. 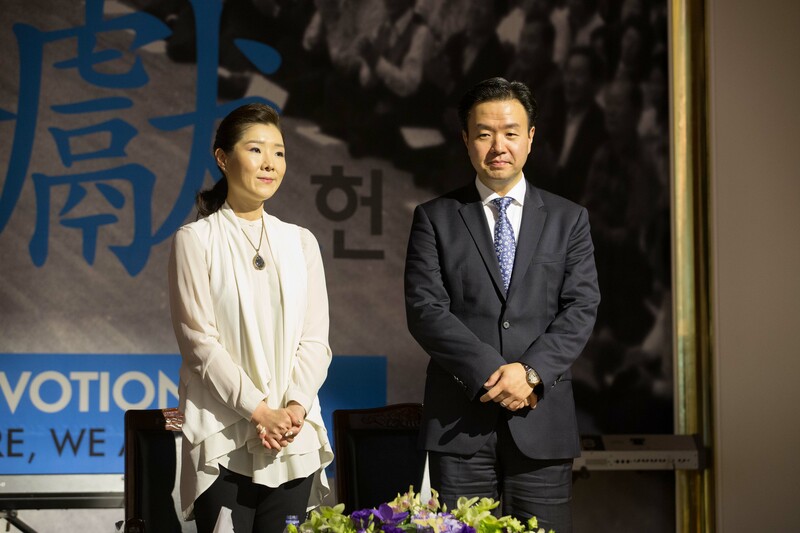 Together with True Father, and as the substantial self of true love, she is our guiding light and model for our movement to steadily advance forward to substantiate Cheon Il Guk. True Father and True Mother have persistently walked and paved the path of the providence together as our eternal True Parents. For the past three years, we faced many difficulties and challenges. Some became confused and uncertain about their path and struggled with their faith. Even I was discouraged many times by the people and circumstances that created division in our family. Yet, True Mother never wavered or lost sight of her mission to substantially complete True Father’s will here on earth. She did not get caught-up in the petty fray. She did not lower herself by spreading blame, hate, and anger. Rather she took the path of true love, praying, hoping, unconditionally loving and taking responsibility for all the things that we did not or could not do. These are the actions of a True Parent, a true leader, one who takes absolute responsibility and makes substantial change by the principles of true love and by vertically centering oneself to Heavenly Parent’s heart and will. We can see the results of True Mother’s determination and leadership. Her absolute true love, rooted in her spiritual communion with True Father, enabled our movement not only to survive, but also to flourish, and rise to a new level. As we approach this 3rd Anniversary, we can feel and see that a new age is dawning. We, who are living at this time, are truly blessed. We have all been blessed, liberated, and united as brothers and sisters under our Heavenly Parent and True Parents, living as one family centered on true love. To substantiate our dreams, we must prepare for the future. Hence, the future generations of our Unification community must grow well and work on creating and completely establishing the Cheon Il Guk culture. Through these words, True Mother emphasizes the importance of living for the sake of others, and leaving a greater legacy for future generations. In addition, she is calling each of us to commit ourselves to sharing this vision and expanding our movement to all of Heavenly Parent’s children all over the world. Only when the world is united as one family under Heavenly Parent can we build the Kingdom of Heaven on earth, which God has so longed for throughout all the ages. So how do we come together as one global family? We can only become one by practicing absolute true love, faith and obedience to Heavenly Parent and True Parents. We all know that it is only because of True Parents that we can be given the grace and salvation to be blessed central family members. We also know that there can be no children or family without parents. That is why we must love and respect our parents. True Father taught us on countless occasions about how to become filial children. We can show the deepest gratitude and love to our True Parents by becoming their true filial sons and daughters by sincerely walking the road of absolute true love, faith and obedience with joy. Beloved and respected brothers and sisters, let this be a time for each of you to reflect on your life and to re-dedicate yourself to taking responsibility to build a better future for all humanity. So how can we become true sons and daughters? By cultivating our minds, hearts and bodies to manifest true love and gratitude and by offering our unique gifts to all humankind and creation. Through our True Parents’ teachings, we have come to know the essence of our truest identity. The seed, the origin of all life was sown with true love. When we realize that we have been loved and blessed from the beginning of time and throughout our lives we can only respond with gratitude. If we can cultivate such a grateful heart, we are then always filled with love in our hearts and we are able to give and spread love to others. If you take this gift and couple it with your youthful energy and your sense of purpose you get the formula for the infinite potential and the power to change the world. You are the embodiment of this miraculous hope; you have the amazing potential, and you are the incredible living and lasting legacy of Heavenly Parent’s and TP’s absolute TL. Many times in our growth period, we may feel unworthy, insufficient, imperfect, or incomplete. However, those are just emotions and thoughts. The truth of who we are is that we are the astonishing gift of life and true love that Heavenly Parent has longed to see realized throughout human history, and made possible by our True Parents. Yes! Here we are! So what should we do with such an astounding gift? As the principle of creation teaches us, we are here to love, be filled with joy and live in peace and happiness. Only true love can restore this suffering world to one of joy. True Parents have always taught the younger generation—each one of you—to focus on growing and developing your heart and character, realizing your unique value, and having a clear understanding of your purpose in life and achieving that goal with passion. By making true love the purpose, focus, and the core of our lives, it will be the source of endless blessings and it will become the wellspring and source of honor, success, resilience, creativity, harmony and dignity. Please reflect deeply on the following teachings of True Parents. By understanding this essential principle taught by True Parents, we can come to understand the basic and elementary force of the universe. Once you understand your true origin, you begin to see what a miracle of life and what a precious treasure you are in all the world. You are Heavenly Parent’s and True Parent’s blessed children. Inside each and every one of you there is the divine light and spark of Heavenly Parent’s true love. This unique gift of life is an irreplaceable force filled with unique talents and diverse abilities that express Heavenly Parent’s love and joy to all humanity. Our growth period should be one that reflects this joy, in discovery and learning. It should be a time when we cultivate our exceptional talents and achieve mastery. With each breath you take, and during each moment, and every experience Heavenly Parent can share and participate on your journey to realize your unique gifts. Your path and inimitable ability when cultivated and united with our global family can create synergy and energy to change the world. Here are TFs words of guidance. As long as True Love is the center of what you choose as a goal in your life, God will be there working along side you in your chosen field. You are the change we hope for in this world. The combination of your youth and your wisdom of the value of true love opens infinite possibilities to achieve whatever you dream. What you dream and how you bring that to waking reality is the god-like power Heavenly Parent bequeathed to each of you as your 5% responsibility. This is the unique life potential that makes it possible for you to become a person who manifests goodness, true love, and mastery in your chosen field. You carry this divine light and power of Heavenly Parent. You have the potential to leave the world a better place than you found it for countless generations to come. The future is your noble choice and your dreams, once realized, can be the source of salvation and grace for countless others. We are the proud, the hope, and absolute filial sons and daughters of our Heavenly Parent and True Parents. We are blessed Central families, who are absolutely centered on our Heavenly Parent and True Parents, possessing true love, true life and true lineage. We should rejoice, praise, and raise each other up to be more joyful and bring this glorious light of true love to all the world. When you love who you truly are, when you can see the miracle of who you are, you become aware that this divine light in you is also in all other living beings, because everything in creation was created out of love. When we start to cultivate and open our eyes to this truth we cannot help but to reciprocate this joy and gift to all other living beings. CSG2: Our path is the way of love. It is one path, whether an individual walks it or a family walks it. The way of love is the same for both. East or West, whatever one’s race or nation, the way of love is the same for all. The direction does not differ. Between the path of love for the individual and the path of love for the family only the number of people is different; the way is the same. It is one road with the same focal point. It is the path of God’s love. Our birth is rooted in God’s love. We all were born within an amazing path of love, which is connected to the cosmos and rooted in the original love within our parents. Even after the Fall, this root holds strong. Our tendency to pursue goodness and our desire to add value remains. It is what makes historical restoration possible. That origin within us can foster new development. When True Mother gave us the vision 2020, it was with the goal of spreading Heavenly Parent’s and True Parents’ teaching of true love to all 7 billion people of the world. This was the blessing True Father gave to all the blessed central families, to be tribal messiahs and bring the blessing and divine truth to all of Heavenly Parent’s lost children. If we know that true love is the key to end all suffering and unconscious destructive behavior of humankind, why is it so difficult to practice and spread? It is natural to think of oneself first, our first instinct is self-preservation. But what make us think of others? It is higher consciousness, maturity, and listening to one’s true conscience that is the divine spark in your soul. Once you realize that your origin is love, you will see that all things in the universe are giving, loving and supporting you unconditionally, and that the goal of your lives should be joy, goodness, fulfillment, gratitude, kindness and peace. In this way, there comes about a shift in that individual thinking. We enter the realm of true love and true happiness filled with Heavenly Parent’s divine light and we come to know that we should share that light with others. We should have the heart of gratitude and love to return and pay forward all the blessings we have been given. We are one global family under Heavenly Parent and True Parents. We should develop our hearts to love all our brothers and sisters around the world. This is the core of all love the Give and Take action of harmony and balance. This is the principle of true love, living for the sake of others. CSG14: In order to get to the kingdom of heaven, we first need to collect all kinds of God-centered love. We must gather the love of the family, the love of the nation and the love of the world, and then go to the kingdom of heaven and unite with God. When we unite with God on this foundation, everything will orbit around God. How do we human beings arrive at the place where God’s love dwells? We must go the way of a filial child, the way of a patriot, the way of a world saint, and the way of a son or daughter of God. Then when we arrive at the place where God’s greatest love dwells, we will settle there. For anyone born as a human being, this is the happiest way and the way of ultimate perfection. Everything is designed to reach this realm. Education, practice, and good karmic action are the keys to honing our ability to love and create more joy. The study of the word, holy texts and Hoon Dok Hae, illuminate the path of true love, making it possible for us to graduate to higher levels of thought by learning the wisdom and truth True Parents’ have already given us. In this way we do not have to re-invent the wheel, so to speak. We cannot teach others unless we have true wisdom and mastery within ourselves. No one but True Parents have this mastery. However with a humble heart and the will to learn, one can master anything over time and then share the successes with others. If you are not perfect, it’s OK, there is a growth period to all things. Just practice and study with more sincerity; do not doubt yourself; do not doubt others; have faith in all, and you will get there. When you do get to the realm of ultimate perfection or enlightenment, share your wisdom and help others achieve that and more. If you are practicing true love, it should not be in a spirit of competition; rather it should be with a heart that hopes and acts so that all can be brought to heavenly completion. True happiness is not when you win and someone else is at a loss. In True Parent’s heart, we all must win and achieve victory as one family under Heavenly Parent. Can you imagine an environment that practiced this level of true love; this is Cheon Il Guk. If we are to realize it, we must practice the way of true love in all we do. CSG22: In our life on earth, there is a right path for human beings to follow. What is that right path? It is the path that is good for individuals, for families, tribes, peoples, nations, the world, the cosmos, and even for God Himself. We all have to advance upon this path. This path is the one and only way of original love. When we perfect ourselves as individuals, it then applies to a perfected life as a couple, a family, tribe, nation, world and cosmos and even God. This is the meaning of oneness. We all started from Heavenly Parent’s love, and when we are saved with the truth of true love, we then know our purpose is to reciprocate this love with all divine beings to even finally reach and bring joy to Heavenly Parent’s heart. When we live for oneness, we transcend who we are as blessed central families, our own family, tribal or national boundaries, space, time, to reach the ultimate peace, God. True love is the source of true life, peace, and joy and the core starting point of all virtues such as compassion, patience, humility, diligence, generosity, growth and change. All life, all living beings and things, are extensions or manifestations of our Heavenly Parent. True Parents have brought this truth to life and they have practiced and perfected this truth. That truth is Heavenly Parent’s heart of true love, true life, and true lineage, showing us the path to true peace and prosperity for the world. One way to learn about Heavenly Parent’s heart is to love and learn through nature, this beautiful earth, the planetary home we share, our globe, the creation of our Heavenly Parent that sustains and gives us all the nourishing gifts that allow us to live. How can we give back and care for all these natural wonders and precious resources. All knowledge, secular or religious, points to a creator and to the natural laws that require that we keep harmony, balance, homeostasis, in all areas of life. Higher awareness, opening the lens of our consciousness to see Heavenly Parent’s light in all living things is our responsibility. From the appreciation of the smallest gifts, we can realize the abundance of the universe and foster a greater heart of gratitude. In this way we can take care of what cares for us all every moment. Would you like to try this? Let us take this time to join hands and take a short meditation by focusing on our breathing. Gently close your eyes and inhale and exhale. As you inhale, feel the belly and chest expand and as you exhale feel the release of all that no longer serves you. When we inhale we breathe O2 which gives us life, and when we exhale, we let out CO2 that no longer serves our life. As we inhale O2 we take in a gift from all the green life in nature; as we exhale CO2 we give back to the trees and plant life. In this simple act of breathing, something we do every moment, we are being unconditionally loved, supported, cared for and nurtured by creation. If we pay attention to all life in the universe, we begin to realize there is give and take action, harmony, and interconnectedness in all things. Learning to pay to attention to all these miraculous gifts of life that Heavenly Parent gives us is the start of an attitude of gratitude. Think of our body, each organ, the circulatory system and respiratory system that carries this oxygen and Co2 in and out of our body each moment. What a miracle of life we are; our body automatically sustains all our living functions. Whether we choose to pay attention to it or not, our body and all creation live for our wellbeing. The beginnings of health and wellness are achieved when we have balanced, grateful, and joyful lives, actions, and thoughts. We achieve this state as we learn to live in harmony with all living things and with gratitude for Heavenly Parent and True Parents. You can apply this awareness to anything. Gently close your eyes and visualize your self doing the work you have dreamed of, your purpose and goal in life. There is no work too large or too small; everything matters when you love it. You can be a business tycoon or a chef. If you have the heart of TL, your skills may be able to help an honorable charity that feeds the hungry. Whatever you choose, make it from the heart. Imagine joyfully doing this work and visualize how your work can help countless others attain happiness and joy. This is your potential to give back all the joy that creation and Heavenly Parent gives us each moment. Can you imagine a world where your divine light shines and inspires the light in others’ lives? That is your potential. This is how precious you are. In this moment cherish who you are. You are a true filial and unconditionally loved child of Heavenly Parent and True Parents. Feel the love that surrounds you each moment. Now visualize all of your loved ones that nurtured, loved, guided, supported, and cared for you so that you could fulfill your dreams or just be here at this moment. Can you feel their love, joy, gratitude, happiness and pride in the great work you do, the miracle of who you are? You are never alone; we are truly blessed to have each other, our blessed central families, our True Parents and Heavenly Parent. Each of you is the most precious gift to humankind! Now gently open your eyes and look around you, and observe the 3,000 other precious gifts and children of Heavenly Parent! What a heavenly network of potential good. Imagine if we harnessed and synergized all the energy we create by being here as one family, doing the work we love, synergizing and working together to realize a greater dream for the world! Imagine it, dream it, choose it, and make your lives the glorious reality you envision. What ever you focus on becomes your reality, if your heart and passion are centered in true love; by going this way you will bring happiness to yourself and all your loved ones. What a truly joyful moment! I can feel True Father here with us, smiling and cheering us on as we follow this path to realize our dreams, making them come true. Let us give thanks to all those who have worked to give us this joyful summer moment. In return we should use our energy to do good, for others and for the planet. This is the karma/give and take, and responsibility we should learn to foster. Our life, our body, our food, our air, all started beyond our consciousness. It was our parents’ love, their lives, our mother’s womb, their love and care to give everything to us that make it possible for us to breathe today. Beyond that it was True Parents that blessed your parents, teaching them true love, true life, true lineage. Beyond that Heavenly Parent has worked since the beginning of time to unite and live harmoniously with absolute, unchanging, eternal true love in order to restore what was divided and to reunite, to rebalance that oneness of mind, body and soul for all his children. Once we realize that we are all One family, we must share, work, foster, and grow more glorious gifts for all 7 billion people, teaching others and acting responsibly for the sake of all living things. We should go beyond the limits and scope of our own lives and truly see what True Parents have mastered and taught. Live for the sake of others. In that way you bring more blessing and joy into your life and into the lives of others. We are all interconnected. We share this world. We must live responsibly in harmony with each other. There is no you or me, no label, boundary, limit, or singular entity, we are all One, under Heavenly Parent and True Parents. Let us bring this awareness to all living beings on this earth, and live harmoniously in our collective home. If we join hands and work together, I am certain that we can shape the future of our world. Please cherish the gift and divine light in your heart, in this way, you will give hope to the people of the world, and you will grow immensely along the way. I would like to say thank you and I love you and I believe in you! Can we collectively unite our voices to show gratitude and love to True Parents? Let us all say kamsahamnida! Salanghamnida! Sunli 3x! Aju! Please give a big loving hug to your neighbor and share your dreams to make them our glorious Cheon Il Guk reality!